I've spent a lot of time talking about my transition from Kansas to Florida. There is nothing that could have prepared me for the last 12 days. 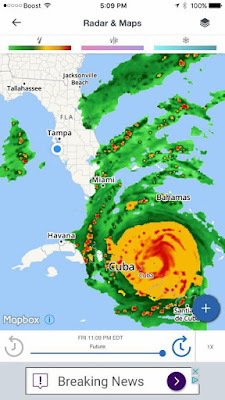 When Irma was first a hurricane in the Atlantic, there were talks about it coming toward America and most directly via Florida. Being that I love in South West Florida, this got on my radar. Last year with Hurricane Matthew we had a lot of rain and wind come though. It wasn't a direct hit for my city. Irma moved all over the place and hit islands hard on its way to us. At first, we didn't think it would be too bad as they projected the storm to stay to the east. Then she was projected to go right up the center of the state. Then with 24 hours before Florida landfall, we are told my city is in direct path and should be hitting us as a Category 3 storm. The little blue dot is me. Can't you see me waving? No.. oh, of course not! I was terrified and probably crying in the corner! Now, I need you to know... this Kansas Girl has been through bad storms. Ice storms and Tornadoes are what we do in Kansas. The uncertainty of a Hurricane... especially one that is 400 miles wide... No thank you!!! I did everything we could to prepare. I had an internal struggle of when should we leave? Should we leave without my husband? Should we leave at all? Is the house going to cave in on us after the roof blows off? My mind was running wild and panic attacks were frequent. "Be prepared!!" they said. Honestly though... How do you prepare for a storm that they are saying could take your life and your husband has been deemed necessary to stay for his job? So much stress and anxiety. Be prepared.. I tried to be! I purchased water, bread, tortillas before we found a store that had bread. Oh and a huge box of Cheese-Its. Well, because Cheese-Its make everything better, right? Irma came and took our power for 2 days. Many homes are still without power 4 days later. They're told it may be up to 2 weeks before it is restored. Blessed is a good way to sum up how I feel that we didn't have to wait those 2 long, sweaty, nerve racking weeks. We read books by candlelight and played flash light games. Slept with the windows open and all in one room to keep everyone safe. It was truly a family bonding experience... with sweat. On the other side of this, of course survived. Otherwise I wouldn't be typing this up now. I did learn a few things. Florida residents laugh through a storm like this. Memes keep things light and people act like they have they Big Girl Pants on. Super Woman is ready to take on the Hurricane. Okay, you crazy Floridian! But like I said: We made it through. The kids enjoyed the weather while Mom and Dad were cleaning up trees and debris. Thank goodness it is over. But as I am typing this, there are 2 Tropical Disturbances brewing in the Atlantic. Maybe I need to keep the boarded windows up a little longer. Glad everything is working out for you and your family is safe and sound <3 Stay safe with those other two coming!